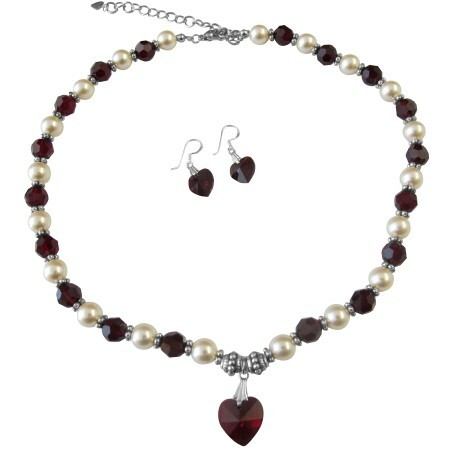 The value of Swarovski Garnet Crystals Heart Pendant & Cream Pearls with bali silver newly style is timeless adds a bit of tradition & giving your true love Crystals is a classic statement of love & care for her. & of course SWAROVSKI are the best! Nothing shines sparkles or dazzles like genuine Swarovski Crystals. This is one made with better craftsmanship or finer components. These handmade beaded Necklace & earrings are handcrafted with 100% Swarovski Austrian Garnet Crystals with Garnet Heart Pendant Swarovski Cream Pearls.